Newfo and getting it done challenge. It's the last day of February. I'm not sure if I'm glad time is going fast, or sad that time is going so fast. I had 4 things on my getting it done list for February. 1. Keep up with Grandmother's Choice Votes for women block of the month. This is done. 2. Start a Newfo at Gail's sew-in day. This is done. I started this pattern called Thanksgiving, designed by Judy Martin, from her book Patchwork Among Friends. 3. Get moved. Unfortunately, this hasn't happened yet. 4. Get unpacked and settled. We've moved some stuff over while getting uncluttered here, so I suppose I could say that this is a partial complete. On the positive side of the moving front, the pictures and the "virtual tour" for the house listing were done today. While Jen, our real estate agent was here today helping us set up for the pictures, she gave an excellent suggestion...... hire someone to do the final cleaning of the house so that everything is spotless and shines, before the listing goes up next Friday, March 8th. I'm all for that, so we have a cleaning crew coming in a week from today. What a load off our backs that will relieve!! 2. Get a sewing area set up at the apartment. 3. Make another trip to IKEA in order to pick up needed furniture to set up the new sewing area. 4. Sew something, anything, maybe pick something from my Newfo list on my side bar. There, those sounds doable. I'm going to link this post up to Judy's Getting it done post at Patchwork Times and Barbara's Newfo link up at Cat Patches. And then, I'm going to make myself a cup of coffee, and get started on goal #1 by loading Christine/s quilt. I'm a bit a a history buff....... well, maybe more than a bit. I love historical novels, and I also love well written accurate representations of history. Ones that are interesting to read, rather than just dry recitations of names and dates. This book is a good one. It's called Blood Sisters: The Hidden Lives of the Women Behind the Wars of the Roses. I find this a fascinating, and often confusing part of England's History. This book, while focusing on the lives and the influence of the women involved in the times, also gives a coherent explanation of the politics and the reasons that led to that conflict. This excerpt, copied from the Kobo website, gives a great synopsis of the book. "The true story of the White Queen and more, this is a thrilling history of the extraordinary noblewomen who lived through the Wars of the Roses. The events of the Wars of the Roses are usually described in terms of the men involved: Richard Duke of York, Henry VI, Edward IV, Richard III and Henry VII. But these years were also packed with women’s drama and – in the tales of conflicted maternity and monstrous births – alive with female energy. In this completely original book, Sarah Gristwood sheds light on a neglected dimension of English history: the impact of Tudor women on the Wars of the Roses. She examines, among others, Cecily Neville, who was deprived of being queen when her husband died at the Battle of Wakefield; Elizabeth Woodville, the commoner who married Edward IV in secret; Margaret Beaufort, mother of Henry VII, whose love and ambition for her son knew no bounds. Until now, the lives of these women have remained little known to the general public. Sarah Gristwood tells their stories in detail for the first time. Captivating and original, this is historical writing of the most important kind." I've had a couple of people asking for more info about this book, and for whom the link above didn't work. So I've copied the book front and info from the KOBO site. There is nothing on my wall this week. There has been no sewing this past week. There has been tons of cleaning and painting and organizing and dry-walling and ceiling repairs. And most of that has been done by Scott and our wonderful son-in-law, Matt. The last of the big jobs is almost done. There was some damage in the ceiling of the basement that had to be repaired. The new dry wall is up, and the taping and "mudding" of it is under way. My primary job today was to go over to the apartment and be there when the gas fireplace people came over to give a demonstration of how it works. While I was there, I decided to start unpacking the box of fabrics that I had purchased way back at the beginning of the year. 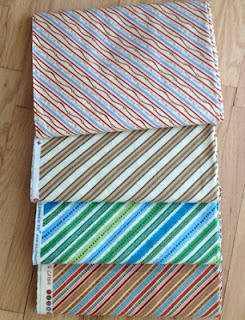 I had found some new fabrics with stripes printed on the diagonal to use for bindings. I've got them rolled on to their mini bolts and ready to live on their shelves. They'll eventually look something like this, although I'm sure there will be some rearranging going on. That area to the right of the shelf is where my cutting table is eventually going to live. f at quarters. I wish I could remember if I had any specific plans for these when I ordered them. LOL!! I guess I'll just have to come up with a new idea. And here is a picture of the fireplace, turned on and cranking out heat, to turn a chilly basement into a lovely warm and inviting space. It's beginning to feel like home. There has been no sewing going on here since last Sunday. All my fabrics are moved over to the new apartment, and so are my sewing machines. The long arm remains here, ready to start up once more with some customer quilts. It feels like it has been out of service more this year than in. The drama with the city for my new long arm room goes on. We had submitted the drawings as they asked for them, with all the amendments they asked for. Then they came back and added more to what they want....... added insulation in the walls and the ceiling. It's beginning to feel like a game, with city hall trying to find out how far they can drive us before we go mad. So, still we wait..... And I consoled myself with actually hitting the check out button on that shopping cart full of fabric at Thousands of Bolts. If I can't sew with fabric, at least I can order it. LOL!! Balance: 6.4 more yards out than in. I had a chance while we were over at the new apartment on Friday to actually open and look at some of the fabrics that I ordered a while ago, but they still aren't unpacked, since I have no place to unpack them to. We have to make another trip to Ikea to get some more shelving. We were going to go yesterday, but then decided that we really should make getting this house in order and ready to list, hopefully by next weekend. Once that is done, we can focus on getting the other place in order. My next job, after I finish posting this, is to clean out the fridge, and get started on washing floors, and maybe on painting the new railing in the upstairs landing. The end of all the work, at least here, is now in sight. What a relief!! Judy, at Patchwork Times is hosting a link up party where we can share books we are reading or, in my case listening to. Back in the summer, I read a book by Kate Morton called The forgotten Garden. I enjoyed that one so much that, when I was browsing around on Audible.com, I saw some more of her books, so I bought and downloaded one called The House at Riverton. The book follows the life of the character named Grace, who was once employed as a house maid at The House at Riverton, and her involvement in the lives of people who lived at the House at Riverton. The memories of her time working at that house stay with her all her life. When she is 98 years old, she is contacted by a director who is making a film about the house and the incident of a poet who killed himself while at a party at The House at Riverton. The book follows Grace as she lives her life at 98 and also as she remembers the past, and the people and events at the house leading up to, and past the poet's suicide. It is well written and well read. It is clean, no foul language, and no indecency. It is well worth a read or listen. There are other book recommendations here at Whatcha reading? I spent most of yesterday finishing cleaning out kitchen cupboards. We have a corner cupboard that we use for our pots and pans that has a lazy Susan thing in it. What a pain in the back, literally, that thing was to clean. I could only get under it in the small section where the circle of the lazy Susan has a notch in it. And I had to climb into the cupboard, under the upper rotating shelf in order to get to the back of the cupboard. Am I ever glad I will never have to do that again! So, by the time all this was done, it was 6 pm. In the meantime, Scott had been cutting and installing baseboards in the 2 bedrooms that need them. Neither of us felt like cooking at that point, so it was off to our local Wendy's fast food place for supper. Then, at last, I could sit down and sew a bit. 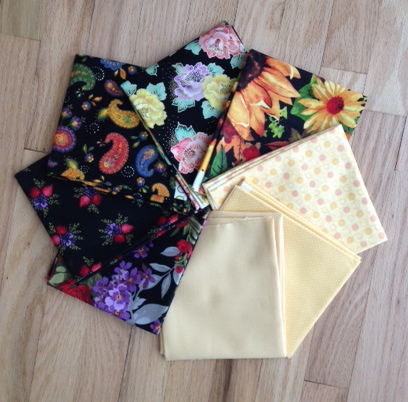 I am caught up on all my Grandmother's Choice squares, and have them all sashed and sewn together. Well, except for the umbrella one, which still needs hand stitching, and has currently gone missing in the mess around here. I'm sure it will turn up, eventually. I couldn't get a picture last night, though. No place with good enough lighting. It is a lot of fun watching this one grow, and not knowing what will be added to it from week to week. I have already decided where it is going to live, and how it will be quilted. It is going to be a sofa quilt. The reds in it will be perfect in the new apartment with the red chairs. I'm not going to add any borders to it, and I'm pretty sure I'm going to quilt it with Baptist fans. So far, it looks quite at home on my couch. I'm linking up, a little late, but better than not at all, to Judy's Design wall Mondays at Patchwork Times. I'm also going to link up to Connie's Tuesday linky party at Freemotion by the River. I've followed her blog for quite some time now, but have never linked up to hers before now. There is lots of other fun stuff to see over there. I think, after all the work yesterday, this is about all I'm going to accomplish today..... blog surfing, and maybe some knitting. I haven't managed a whole lot of stash reduction this past week. I had 2 customer quilts to do, and I had to get them done before the weekend. 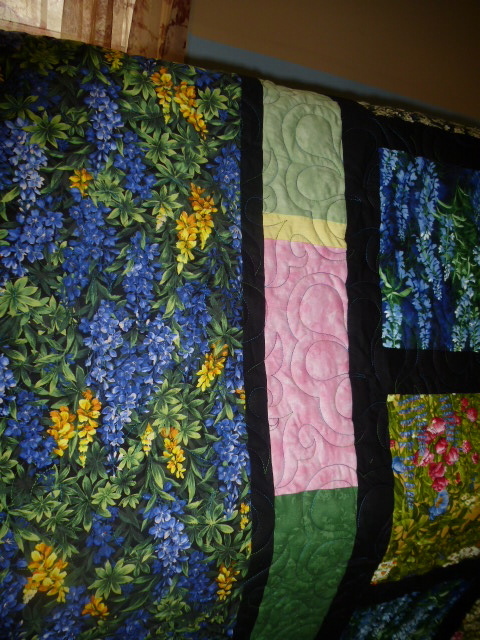 They were gorgeous quilts, too. It may have been winter outside, but it was spring in my sewing room. They were both the same pattern, using the same fabrics. I love the lupins in the borders. But then I think lupins are one of my favourite flowers. I quilted each one with a different pantograph. One had the pantograph Rhapsody, and the other had the pantograph Fay Feathers. Gorgeous, absolutely gorgeous colours in these quilts. The reason I had to rush these was because I'm working at the hospital this weekend, so Scott has used the opportunity to paint the master bedroom/sewing room. So, the sewing room that was oh so neat and tidy last week, now looks like this And it will continue to look like this for the next couple of days, until the painting is done, and the baseboards are in. We moved the temporary table with my sewing machine on it down into the dining room area, so I'm still good to sew. The only outage I had this week was a couple of the squares for the Grandmother's Choice block of the week. I'm hoping to do at least one more of those before going in to work this afternoon. I have in numbers this week. My dearest husband surprised me on Valentine's Day with a fat quarter pack of fabrics. I went to try and take a picture on it before writing this, but I can't get at the drawer of the dresser in that sewing room that I put it in. It is a colour palette that is really pretty, but outside of what I usually use, so it will be fun to find a project for it and use it. Balance: 6.2 yards more out than in. I had a close call yesterday. There was an email sitting in my inbox from Thousands of Bolts. They currently have a sale going for $3.29 a yard on a whole pile of fabrics. I went shopping, and before I knew it, there were 58 yards of fabric sitting in my cart. They are still sitting there. I restrained myself before pushing that final button. It is always a good time to order large amounts for backings and backgrounds. But, do I really need 58 more yards of fabric? 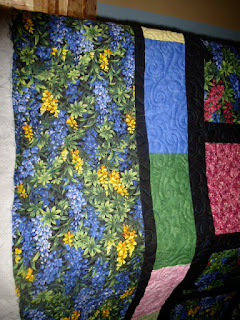 I'm linking up to Judy's Patchwork Times for her stash reports. This is just going to be a quick post. I've been working on getting caught up with the Grandmother's Choice block of the week. I finished block # 22 Jack's Delight and block # 23 Girls' Joy. I don't have a design wall this week. But I do have a design floor. I started a new quilt on Saturday, and got 2 squares done then. Yesterday, I sat down and made a 3rd square. If I make one more, I can count it as one quarter of the squares for the main body of the quilt done. I am totally and completely in love with these squares. I think this is going to be one of those work on it consistently until it is done patterns. But the really big accomplishment of the week has been the condition of the studio/bedroom. All of the stuff and clutter is out of it. Only the essentials to long arming, and a little sewing now and then remain. From here on, it should be easy to do stuff as necessary in this room. It still needs painting and the baseboards put in. The new closet looks great. I have a couple of customer quilts to do this week. I'm hoping to have them done by Thursday. I'm working a 3 day weekend starting on Friday, so Scott is planning on doing the wall repairs, and painting and baseboards while I'm at work. I need to figure out something to do with the threads before then, since all the peg board will be coming down, and the bulletin board on the back of the door will have to come down too. 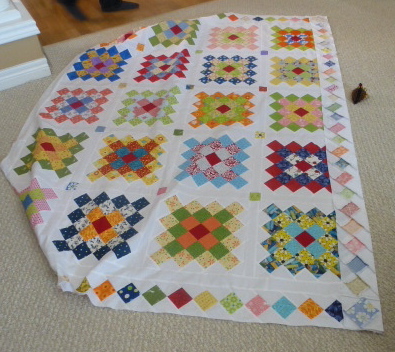 Then on Monday I can contact the next person on my list to bring her quilts over. And I'll just continue working this way until city hall gets its act in gear and decides what they will let us do. In the meantime, if we have to leave this room as a studio set up while the house is being sold, at least the people coming in to see it won't run out screaming in reaction to all the chaos in this room. I'm linking up to Judy's Patchwork Times Design wall Monday post. There is lots of fun stuff to see over there today. Since I cut out most of a quilt this past week, and since I count my stash as out once it has been cut for a project, I have big numbers to report this week. Balance: 11.5 more yards out than in so far this year. I think I like this business of having positive numbers. Of course, there is still an unpacked box of fabric that I purchased waiting over at the new place to be added in. But I just might be able to balance that off with at least some more used numbers. Most of that order is for backings. The rest of it is for kids quilts. I found while doing all those quilts before Christmas for the kids, that I like working with all the fun fabrics that work so well for kids. I have a whole pile of border prints and also some panels that were printed as squares, with pictures of different dogs and cats, that would make up into some fun kids quilts. The London Friendship Quilter's guild collects quilts for kids in the Children's Aid system, so some of those would be perfect for that. I'm linking up to Judy's Stash Report at Patchwork Times. Lots of stash reductions and additions to be found over there. Just the best day. It started much earlier than my days usually do, at about 7:50 am, with my dearest husband bringing me a cup of coffee to wake me up while I was still in bed. He knew I was going out for a sewing day, and kindly brought me a cup of coffee to make starting the day a bit easier. He's such a sweetie....... I think I'll keep him. Christine came to pick me up about 8:45 and away we went to Gail's for a sew day. I started sewing on my new quilt, "Thanksgiving" from Judy Martin's book Patchwork Among Friends. In the 5 hours we were there, I finished 2 blocks. I am totally in love with these blocks. I wanted to keep on going, but, sadly, I had to come home and do some packing and moving of stuff. Gail was working on putting borders onto her Great Granny Squares quilt. By the time we left, she had all the borders sewn on. She's a pretty fast piecer. Christine was working on machine quilting a baby quilt, and then on her nine patch swap blocks. Karen was working on a Yellow Brick Road quilt. Bad blogger that I am, I didn't get pictures of their projects. While I was at Gail's, Scott and Matt were here working on putting the closet back in the master bedroom. It was a successful operation, and the bedroom that became my studio is slowly transforming back into a bedroom. While they finished up the closet, I grabbed a whole pile of stuff that needed to be out of that room, and moved over to the apartment. I actually remembered to take the camera with me this time, and take some pictures. 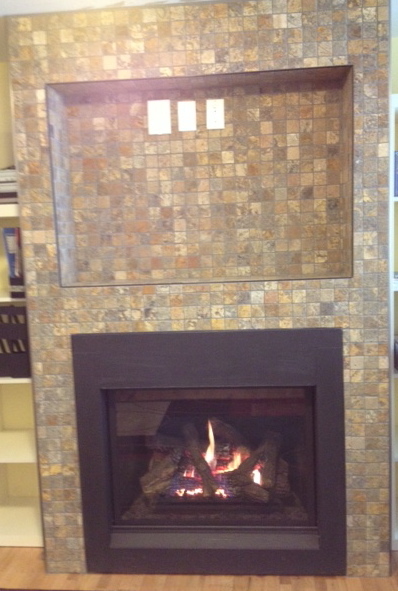 Here's the finished fireplace, with the cubby hole above it waiting for the TV to be installed. Beside it is the IKEA shelving unit that Scott and I put together on Wednesday, without either one of us losing any hair. Some of the stuff I took over today will live in that shelving unit. I didn't want to get too carried away putting stuff in it, though, because it still needs to be fastened to the wall so it won't tip over. It didn't make sense to put in things that will only need to be taken back out again. The other side of the fireplace will also be getting a shelving unit. Here's one view of the kitchen, with the chairs we also picked up and put together on Wednesday. That will be our dining area. And this is what the kitchen looks like from the other angle. So after all that, we had a very simple supper of french toast. Then, because Gail and Christine were talking about the Mystery quilt pattern by Bonnie Hunter they are planning on doing, starting in March, and they asked if I was interested in playing along with them. I said yes, since I am having so much fun not being a solitary quilter any more. That, of course, meant that I had to go out to get the pattern in the current Quiltmaker magazine. The first stop was Chapters. They didn't have a copy of the magazine, but they do have a Starbucks. While Noel was here, he got me started on Starbucks hot apple cider, with the spices and whipped cream and caramel. It is soooooo good, like drinking liquid apple pie. So, I picked up one of those while in there. But then, I still had to see if I could get a copy of that magazine. Next stop, Walmart, and they had a copy. So, now I can study the beginning instructions, and see if I can find the fabrics to use in it. All of my fat quarters of fabric are still here. 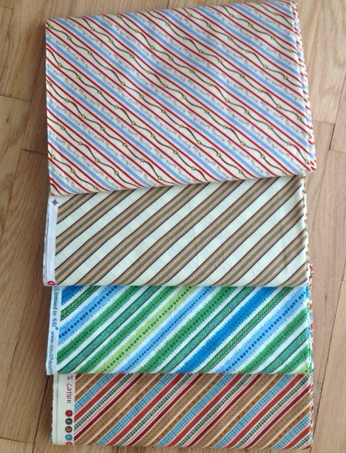 But the rest of my fabrics of larger cuts than fat quarters are over at the apartment, still in boxes. I just might have to do some more unpacking. We've been on the receiving end of quite the snow storm today. So, I decided that it would be a jammies play day. Gail is having a sew day for a few of us from the guild who can't make it to the quilt-til-you-wilt day. I'm starting a new project this month, and I did the majority of the cutting today. I'd already used my GO cutter to cut all the fat quarters into the 2 inch strips I needed. So all I had to do today was to cut the strips into the smaller units. I don't think I've ever pre-cut this many pieces for a quilt before. I hope I've gotten it right, and won't regret it. I have to take advantage of the sew day at gail's, because there isn't a lot of sewing going on around here. This is what my sewing room currently looks like. We've been stripping wall paper and getting this room ready to go back to what it is supposed to be..... the master bedroom. 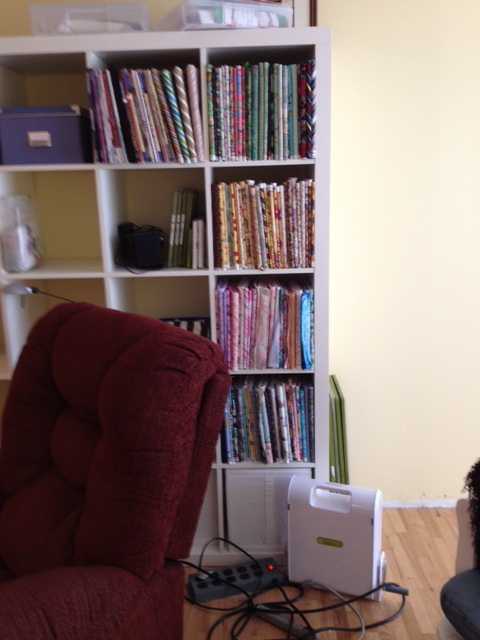 Here is what my sewing corner now looks like. This area used to be the closet. Matt is coming over tomorrow to help Scott turn it back into a closet again. I'm going to be emptying everything out of it except what I need to use the long arm, and move it all over to the new place. If I want a sewing fix, I'll have to go over there. It will still need the walls repaired and painted, but at least I can get back at the long arm again before then. Painting this room will be the very last thing we do. Is it my imagination, or is this process taking forever to get done? Stash Report, week 5, 2013. No sewing or quilting happening here this past week. We are still stuck in the midst of getting the house ready to sell. Scott finished painting the ceiling in the living room, so things are on their way to being put back together. What a nightmare painting these ceilings have been They are covered with that popcorn textured stuff..... the stuff that's all rough and falls off, and gums up the paint roller, because it comes off as it is being painted. What a mess!! But, they are done, and they look good. We've moved everything in my sewing room. The sewing table has been dismantled, and almost all the wall paper stripped from the walls. It needs to have the walls repaired now, from taking off the wall paper, and then it needs to be painted, and it needs to have the closet put back in. We've got all the stuff we need for installing the closet here. Unfortunately, it didn't come with instructions. However, I have enough room on top of the dresser I use as my cutting table to put a cutting mat and my GO cutter. I am starting the cutting for a new quilt. It's another Judy Martin pattern called Thanksgiving. It from her book, Patchwork Among Friends. There is a picture of it at that link. It's the one with the leaves. I guess this can count as my February Newfo. I finally opened one of the fabric packs that came in the mail, since it was all fabrics for this quilt, so I'll be adding it in now. Used this week: 2 yards cut for "Thanksgiving"
Balance: .1 yards more out than in. 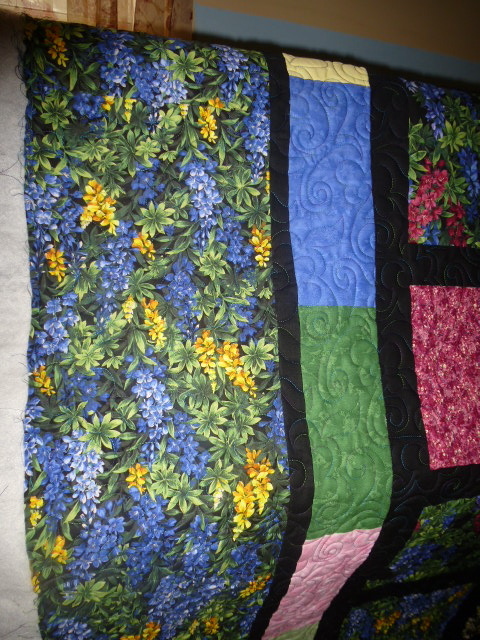 I'm going to continue cutting for this quilt, so that, come next Saturday and Gail's sew-in day, I'll have something to work on that is new and fresh and exciting and fun. The real estate agent is coming over on Tuesday for us to sign all the appropriate papers. We are hoping to have everything ready for a photographer to come on the 12th of this month. I don't know if we'll make it by then, or not. It sure doesn't look like it right now. *sigh* I suspect you are going to be a relieved as I am when this is all done, and you won't have to hear about it any more, and I won't have to write about it any more.